Look. 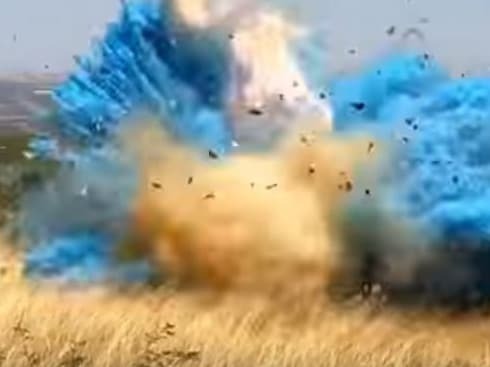 Most gender reveal videos are weird, but this one tops them all. In 2017, Arizona border patrol agent Dennis Dickey decided to partake in America’s latest, tackiest tradition — doing a gender reveal party. Sure, it an always excessive narcissistic act that does not take into account the natural complexities of gender, but also, the way Dennis did it — firing a shot into a package of explosives surrounded by dry grass — resulted in the massive 45,000 acre sawmill fire. I mean. That is a hell of a gender. A hell of a stupid ting to do too, but also… one hell of a gender. The video above shows the fires in slow motion, and shows the flames spreading that eventually took around 800 fire fighters to put out. Wow! Gender reveal! Beautiful! Wow! The fire was started on April 23, 2017 near Green Valley Arizona, and he video of it was handed to the media because its the dang law to give out videos like these!! Dennis immediately called the police and explained his role in the fires. After a plea deal, he recieved five years probation and a two million dollar fine which was later decreased to $200,00. Be careful with fires and gender folks. Both are explosive ideas that man can not control! Do you see what happens now when you fail to acknowledge the natural fluidity of gender from an early age!? Damn fires break out! Still, if this kid doesn’t grow up to be the most manly man to ever exist, then this gender reveal party will all be for naught. Let’s hope he;’s actually masculine and not one of those sad guy who lifts weights forever to one day get into a very weird fight. Heck yeah! What did you think of the very dumb video? Does it make you want to do or avoid a gender reveal party? Let us know in the comments or on Twitter at @WhatsTrending. VIDEO: People Make Their Own Lion King Live Action Recreations – Lion Kinging!